A group of South Korean scientists has developed a graphene with enhanced thermoelectric capabilities, a state-run science laboratory said Monday, a discovery that could be used for wearable technologies such as bendable electronic devices. Graphene is an atomically thin two-dimensional allotrope of carbon materials in which one atom forms each vertex. It is about 200 times stronger than the strongest steel and has applications in semiconductors and various electronic devices. The team led by Son Jeong-gon discovered that when graphene is shrunk to a 10 nanometer scale, not only its electrical properties but also thermal conductivity and thermoelectric properties are significantly altered, the Korea Institute of Science and Technology said. "Here, we fabricate large-area, sub-10 nanometer single and bilayer graphene nanomeshes from block copolymer self-assembly and measure the thermal conductivity, thermoelectric and electrical transport properties to experimentally verify the effect of sub-10 naometer quantum confinement, phonon-edge scattering and cross-plane coupling," the researchers aid in a paper. 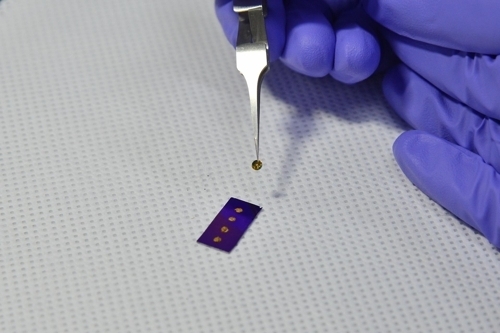 "We hope that nano-patterned 2D materials can be expected to contribute to obtaining highly efficient and flexible thermoelectric materials for the self-powered devices of wearable electronics," Son said.